Christmas is a time for giving and spending time with family. It’s typical to exchange gifts with loved ones, but every year, it’s the same thing. You’re still probably scratching your head wondering what to buy your loved ones this Christmas. Do you get the male in your life his thousandth tie, or do you find something he will never expect? What about the females in your life? Do you get them another sweater or pair of earrings that will sit in the closet until Christmases to come? The good news is that we figured out an easy solution for you. 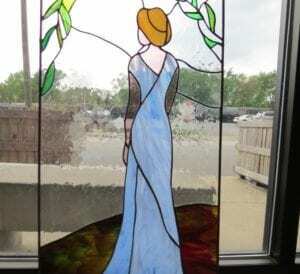 McCully Art Glass and Restorations in Lafayette, IN will make this upcoming holiday one to remember, as we bring more light into your home with our leaded stained glass. Leaded stained glass is the perfect gift for all ages. It can be symbolic in a number of ways, while brings great reminders to your loved ones of you and how much you care. For instance, if one of your loved ones experienced a loss in the family, allow the angelic light to dance through the colored paneled windows of the leaded stained glass. Have a specific image you want portrayed? We can do that. Bring joy this Christmas with a beautiful token of leadedstained glass. We have a large repertoire of items we can create from exterior aesthetics to interior, such as leaded stained glass lamps. If you’re not in the market for a new leaded stained glass piece, we can also restore any old leaded stained glasses already in your home. Maybe you have that dusty broken lamp in your attic, and you’re not quite sure what to do with it. Give McCully Art Glass and Restorations a call at (765) 588-5463, and we can help restore your leaded stained glass, so you can give it to your loved one just in time for the holiday! What better way to surprise your loved one with a sentimental gift from years ago that he or she thought could never be repaired? We can do onsite or offsite repairs, depending on the task at hand, but allow us to help you bring merriness into your home this Christmas. Why go to the store and buy something that will end up pushed in the back of the closet of the person receiving it? Call us today at McCully Glass and Restoration, and we will make your Christmas the best one yet with our leaded stained glasses. Put the merry back in Merry Christmas this holiday season with our beautiful leaded stained glass pieces.